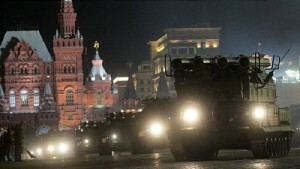 Thousands of Muscovites were lucky enough to catch a glimpse of Russia’s latest military hardware rolling across the cobbles of Moscow’s iconic Red Square during the first night-time rehearsal ahead of Victory Day parade. Infantry from Russia, Armenia, Azerbaijan, Belarus, Kazakhstan, Kyrgyzstan and Tajikistan practiced their performances in front of the public for the first time this year, ahead of Victory Day on May 9. Troops from other countries such as India, Mongolia, Serbia, and China were also present at the rehearsal. But the most anticipated event of the rehearsal was the debut of the latest models of the Russian armored tank T-14 built on the “Armata” platform as well as the showcasing of the latest 152mm self-propelled artillery howitzer Coalition-SV. The Armata’s main advantage over similar existing technology lies in its unmanned turret, controlled remotely from an isolated armored capsule. The latest tank has a state-of-the-art radar system that can simultaneously track up to 40 ground and 25 air targets within a 60-mile radius. The Kurganets-25 and the Kornet-D, an upgraded version of the hard-hitting Kornet anti-tank system, were also driven during a run-through in the early hours of Wednesday morning. Kurganets-25 features a new active-defense system against tank shells. But to preserve intrigue over the main parade on May 9, whch marks the 70th anniversary of defeat over Nazi Germany, parts of the newly showcased military technology were still covered in a special cloth casing. Among the new technology to be showcased are the latest models of weapons for the Russian Airborne Troops, including a multi-purpose armored vehicle, Rakushka, as well as mobile missile launch system Yars. Over 15,000 personnel and about 200 pieces of military equipment will be on display, including weaponry never before seen by the public when the Victory Parade kicks off on the morning of May 9, which falls on a Saturday. For those who still want to witness the Russian military hardware on the move before the Victory Day parade, three more rehearsals are scheduled to take place on May 4, 6 and 7.